Yearnings for some family fun? Or better yet: how to learn something while you're having fun? The short answer is: explore your community: the place in which you live and the people who inhabit it. Now a longer answer. 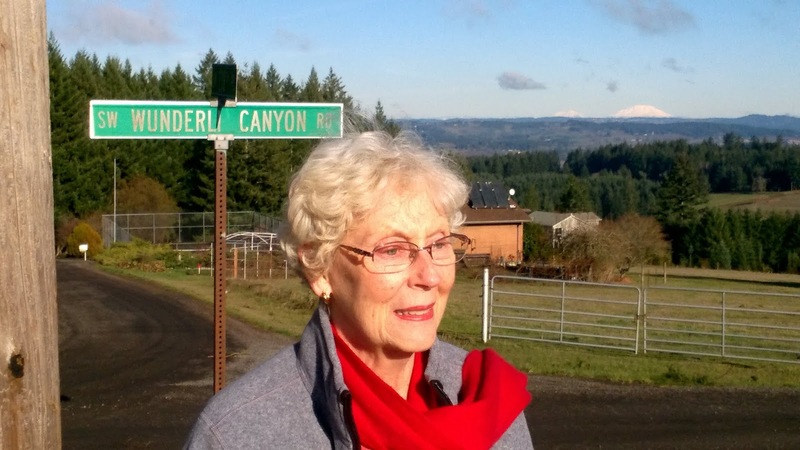 My family moved forty miles to a new community: Newberg, OR. New to us. Well, actually I must qualify that. We'd visited family members who were living in Newberg since childhood in my wife's case and since our marriage in my case. Why? Because Lucy's grandmother, aunts and uncles lived in the town or nearby. So, before we moved in May, 2018, we already knew something about Newberg. But we've found more learning adventures in this town than we expected. Here's a recap of one such joyful day. From Chehalem Mountain, view to Southeast. Lucy and I live down there in the valley. Photographer: M. L. Stevens. In public domain. Via Wikimedia Commons. Two weeks ago, this is what we explored: Bell Road, new to us, running east to west along the top of the ridge. We traversed forests and fields and viewed farmhouses, suburban homes, even suburban view mansions. We traveled confusing, curvaceous roads without a compass. The map we used was inadequate and we lost our way a couple of times. But we kept exploring, using our gut instincts for directions. Finally, we got a reward for the time we'd spent and risks we'd taken. We found the intersection of S.W. Mountain Home Road and Wunderli Canyon Road! Very near to the intersection we discovered a small, white United Methodist church building. We hopped out of the car to explore this spot rural gem. 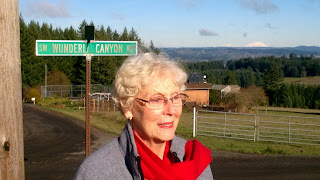 Standing to the right of the front door we looked north over the hillside and valleys onto the Tualatin Valley and, far away, numerous suburban neighborhoods. Absolutely breathtaking! I discovered a display of three cornerstones on the church porch. 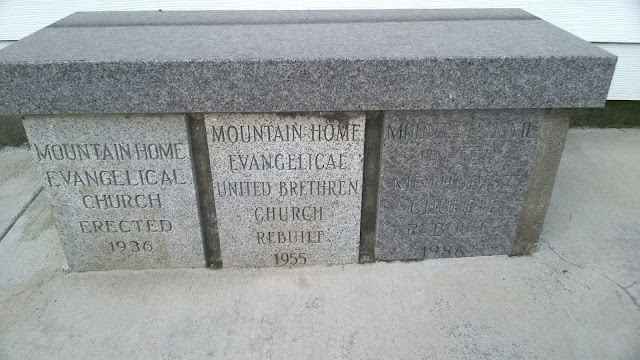 The earliest stone carried the name "Evangelical Church, 1936." The next showed the words "Evangelical United Brethren Church, 1955". The third stone showed: "United Methodist Church, 1968." Church history carved in granite. A bit of personal history: I am retired from the ordained ministry of The United Methodist Church. The fatherly Bishop Maynard Sparks ordained me into The Evangelical United Brethren in Jennings Lodge, Oregon in 1968. And much earlier, in 1940 when I was a year old, my pastor baptized me in the First Evangelical Church, Tacoma, Washington. The three cornerstones thrilled me because they recited my own personal church affiliation history, which has been so meaningful to me, over my eighty years. I like to say, "I've never changed church denominations, but my church has changed on me three times." Back to our trip. Lucy, my wife, received the next big personal thrill. At an intersection just north of the church Lucy found a road sign: "Wunderli Canyon Road." Prior to our marriage Lucy's last name was Wonderly. Is there a Wunderli-Wonderly connection? From Lucy's father years ago I'd learned that his family name in its original German form was Wunderlich. But what about the Wunderli of Wunderli Canyon Road? We wondered, could some distant relative of Lucy's have settled in a canyon near the hill top on which we were now standing? Had someone (maybe an immigration official decades ago?) changed Wunderlich to Wunderli in the case of the Wunderlichs for whom the road was named? Whether "ja" or "nein," the possibility intrigues. From our vantage point on the farm field we saw Mt. Saint Helens in Oregon and Mts. Adams, Saint Helens and Rainier in Washington State. That vista in itself thrilled us. Road-sign reads: Wunderlich Canyon Road. Lucy Wonderly, gazing off into family history. Mt. Adams in central Washington State in the distance. Recent rains had turned Wunderli Canyon Road into a slippery, muddy one-way track. We drove down into the canyon for a few hundred feet to a turn-around and retraced the route up. We'll return some dry day to explore the road to its end. Before this exploring trip we had thought we knew the area in which we live. But once we explored it further we achieved some power-packed emotional rewards and a desire to explore more. Your community, no matter where you live in the world, undoubtedly holds similar surprises for you. I wish you enjoyable explorations in your neighborhood. How can you get started? Go do it.